Here you'll find a variety of baby sailor suits and toddler sailor suits that are just right for a portrait, a party, pagaent, or any patriotic occasion. 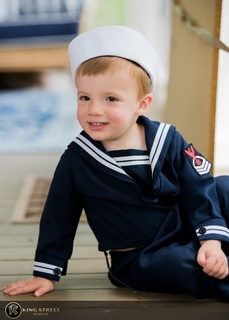 Having trouble finding the perfect sailor outfit for your baby boy or toddler boy? Contact us if there�s something specific you need or if you have questions about sizes. Remember that C. I. Castro sailor suits run small and you may want to order at least one size larger than usual. Check our C. I. Castro size chart to be certain of the size before you order.